Funnel-web spiders are found in eastern Australia, including Tasmania, in coastal and highland forest regions - as far west as the Gulf Ranges area of South Australia. Thirty-six species, including three tree dwelling species, have been identified. Funnel-webs burrow in moist, cool, sheltered habitats - under rocks, in and under rotting logs, crevices, rot and borer holes in rough-barked trees. In gardens, they prefer rockeries and dense shrubberies, and are rarely found in more open situations like lawns. The most characteristic sign of a Funnel-web's burrow is the irregular silk trip-lines that radiate out from the burrow entrance of most species. These trip-lines alert the spider to possible prey, mates or danger. Rain may flood burrows and the temporary retreats of male Funnel-webs, causing an increase in their activity. 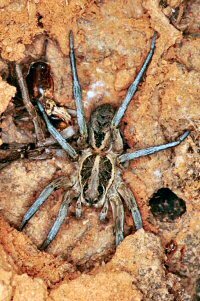 Funnel-webs are very vulnerable to drying out, so high humidity is more favorable to activity outside the burrow than dry conditions. Most activity is nocturnal. Gardeners and people digging in soil may encounter Funnel-webs in burrows at any time of the year. 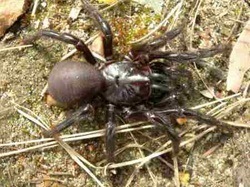 The Sydney Funnel-web Spider (Atrax robustus) occurs from Newcastle to Nowra and west to Lithgow. They especially favor the forested upland areas surrounding the lower, more open country of the central Cumberland Basin. This includes the Hornsby Plateau to the north, the foothills of the Blue Mountains to the west, and the Woronora Plateau to the south. Funnel-web occurrence is low in much of central-western Sydney, and also the sandy coastal parts of the eastern suburbs and the Botany Bay area. They do better in areas of sandy clay, shale or basaltic soils that can retain moisture more effectively. Female Funnel-web Spiders spend most of their life in their burrows, but do occasionally hunt on the surface at night. Adult males however leave their burrows and wander in search of females, particularly during summer and autumn. This is when most encounters with humans occur, with males accidentally wandering into houses and garages, often via gaps under doors. The males spend their entire short adulthood seeking as many receptive females to mate with as possible. Male Funnel-webs approach the females' hidden burrows, possibly by following the scent of their chemical attractants. During mating, the male must restrain the female from striking him with her fangs using the spurs on his second legs, while he transfers sperm via his pulps into her genital opening. The female then spins a pillow-shaped silk egg sac, into which she lays over 100 eggs. She cleans and turns the egg sac several times during incubation and will defend it vigorously if disturbed. The spider lings hatch about three weeks later, and stay with the mother for a few months. After two moults, they leave her burrow, dispersing by foot to eventually make their own burrows. Juvenile males will stay in their burrows until their final adult moult, after which they will become wanderers. Funnel webs mature in about two to four years, with the females living to ten or more years, and the males dying about six to nine months after maturity. Bites are most prevalent during summer and autumn when males leave the burrows in search of females. Accidental encounters with wandering males usually occur in gardens, houses, garages and sheds - particularly ground-level dwellings on concrete slabs. Bites are dangerous and can cause serious illness or death. The venom appears to particularly affect primates (ie humans), whereas other mammals - such as cats and dogs - are relatively resistant. The male Sydney Funnel-web Spider is more dangerous than the female. This is because the toxic venom component that attacks the human and primate nervous symptom so severely is only present in male spiders. Initial symptoms after a bite include local pain, mouth numbness, vomiting, abdominal pain, sweating and salivation. Ant venom is available and no deaths have occurred since its introduction. There is currently much conjecture regarding the effects of the bite from this spider. It has been linked with a spreading skin ulceration known as necrotic arachnidsm, which, as yet, has no easy cure. Current treatment involves a series of painful skin grafts in an attempt to halt the continued spread. At this stage it seems likely that this disease is caused, not by the venom of the spider, but by certain bacteria present on the spider's fangs at the time of the bite. If this is the case, it is also likely that several different types of spider may cause this painful skin problem, including white-tails, black house spiders and wolf spiders. It is also evident that such a condition does not always develop in the case of a bite from these spiders so it may depend greatly on the reaction of the bite victim with some individuals being highly susceptible because of an allergic reaction to the bacteria. The white-tailed spider has a long cigar-shaped, dark grey abdomen with a creamy-white speck on the tip. The legs usually have a brownish hue. A large female may reach up to 20mm in body length, males around 12mm. White-tailed spiders are found in cool dark areas such as under bark, leaf-litter, etc. It will readily utilise buildings and is common in private houses but is not often seen because the web is small and temporary and the spider is most active at night. They are slow moving spiders which wander great distances looking for prey. The white-tailed spider's main prey is other spiders. It is an active hunter, stalking the spiders while they are in their own webs. The black house spider in particular is a favorite food item. 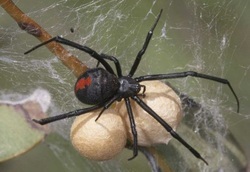 The female white-tail lays around 80-100 pink eggs in a silk sack and guards the 'nest' until the spiderlings emerge. On hatching, the little spiders disperse to find their first meal. Like its famous relative, the black widow spider, the female red-back is certainly not adversed to making a meal out of the hapless, smaller male of the species after mating. It is thought that this maybe why males are so small so they can approach the female undetected and possibly have a better chance of escape after the job has been completed. They will fiercely protect there egg, as my daughter Charmaine recently found out. They tried to remove a egg from there car and the redback scurried out and sat on the egg and started attacking the stick. These spiders are very dangerous and i have noticed in the past decade they are growing bigger and they are coming inside houses to nest. 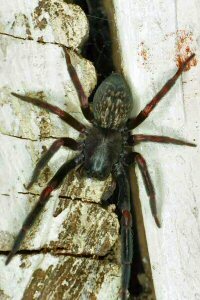 The red-back spider is closely related to the black widow spider of the United States and the katipo of New Zealand. The female red-back is black with a distinctive red or orange marking on its back, although this may sometimes be absent. These markings may be broken into spots in front and, sometimes, thin white lines may be visible. The female can grow up to 15mm long. Males are very small and usually only grow up to 5mm long. The female is the only one capable of harming humans as the male's fangs are incapable of penetrating human skin. The male is short-lived and has more complex markings than those of the female, incorporating white and sometimes yellow markings. 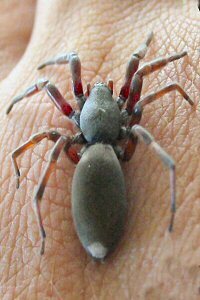 Red-back spiders can be commonly found in logs or under rocks in the bush as they tend to reside in dark, dry areas. In suburban regions, the red-back has been known to live under roof eaves, floorboards, shelves, flower pots or in garden sheds. The web is a tangle of dry silk. The traplines are sticky to assist with catching their prey. Red-backs eat almost any small insects that are caught in their webs. They will also eat skinks and even juvenile mice, snakes and frogs. Red-back spiderlings will also eat their siblings. The red-back spider weaves a snare-like structure that traps prey walking on the ground beneath the web. Its spring-like action traps the animal into the small web above, where it cannot escape from the traplines that are covered with sticky globules. Female red-backs take about 2-3 months to mature and can lay 3-8 egg sacks between September and May. Each sack can contain up to 300 eggs. However, most of the hatchlings do not survive because they are eaten by their siblings and are very prone to wasp parasitism. Wolf Spider Scientific Name: Lycosa sp. There are several species of hunting wasps which target wolf spiders, paralyzing them with their sting and then dragging it to a burrow. There the wasp lays an egg on the spider's body, which then becomes the first meal for the wasp larva when it hatches. There are many different species of wolf spider, which are so named because they actively hunt and run down their prey. Most species are dark brown or grey in colour with black, grey, orange or brown markings. Wolf spiders have three rows of eyes - the top row of two are medium sized, the middle row consists of two large eyes and below are a row of four smaller ones. These provide the spider with exceptionally good eyesight for spotting and catching its prey. Its body is relatively hairy and the legs are long. The male can reach up to 20mm long and the female up to 35mm. Wolf spiders are not generally regarded as dangerous. However, there have been some instances where bites from a wolf spider are believed to have caused the spreading skin ulceration known as necrotic archnadism. This disease is probably caused by bacteria infecting the bite wound rather than the actual venom of the spider. Wolf spiders occupy a huge range of habitats, including open woodlands, grasslands and forests. Many species reside in burrows, which are about 25cm deep. These are laboriously excavated using the spider's fangs. Various species of wolf spider are common in private gardens and at night a torch will often reveal huge numbers of reflective eyes scouring the backyard for suitable prey items. The wolf spider eats crickets, other spiders, ants, grasshoppers and many other types of small invertebrates. Large species will also occasionally take small lizards and frogs. It usually searches for its food at night. The male wolf spider attracts the female by waving its pedipalps and front legs in the air. As long as these signals are carried out in the right fashion, the female does not regard the male as being the next potential meal. After mating, the female produces a silk mat into which she deposits around 100 eggs. The silk is then rolled into a protective ball which she then attaches to her abdomen and proceeds to carry it around with her until the eggs hatch. After hatching, the babies crawl onto the mother's back and remain there until their fat reserves have been used up and they need to start finding their own food, which may take several months. Venom toxicity - the bite of the Black House Spider is poisonous but not lethal. Certain people bitten experience severe pain around the bite site, heavy sweating, muscular pains, vomiting, headaches and giddiness. First aid and medical attention should be sought as soon as possible. Area of distribution - Australia-wide.Spider Identification - adults are about 15 mm in body length and of a dark brown to black velvet textured appearance.